The Time Living stunning Inova Victorian style bed frame is available in single, small double, double and king sizes. 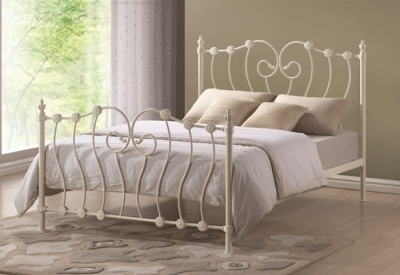 This beautiful piece of bedroom furniture has a metal structure with an ivory finish. The features on the bed compromise of a large headboard and foot end both with curved bars and numerous circular finals. The Inova bed frame has a strong wooden sprung slatted base suitable for a UK standard mattress, this bed offers a comfortable nights sleep and a decorative style to your home.